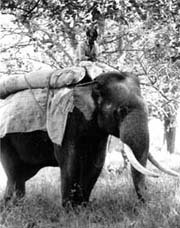 The wild elephants that once roamed freely over southern China, retreated long ago to the dense tropical rain forests which cover the mountains near the nation's borders with Myanmar (previously Burma) and Laos. The dwindling elephant population that now survives has been further ravaged in recent years by poachers eager for the animals' tusks, a pair of which can fetch them as much as us $10,000. And that is a big sum indeed in an area where four out of every five people come from farming households and where the per-capita income does not exceed us $300 a year. Now, after years of apathy and neglect, the local wildlife officials say that they are getting serious about protecting elephants and other endangered animals, and vow that the poachers are in for some severe punishment. The elephant population has now stabilised at a little more than 200, claim the official figures, though the animals amble through a remote territory that straddles the border with Laos, making it difficult to count them accurately. In many parts of the country, one of the costs of fast economic growth over the previous decade has been the extensive damage suffered by the environment and wildlife. In this area of rich rain forest, there are more than 600 species of terrestrial wildlife and nearly 100 have been deemed worthy of state protection, including the animals in question -- the elephants. Yet, it is sometimes difficult for the state to protect these endangered animals, especially when the officials of the state are themselves guilty. Growing corruption among police and army officers has led to wide tolerance of any venture that makes money, and some take part in poaching these animals. The most shocking case of poaching in this region of the country occurred four years ago, in 1994. Two hunters were caught killing elephants and upon interrogation, they disclosed that they had been hired by a local police chief who had agreed to pay them a few hundred us dollars for the tusks he planned to sell for thousands. Rather than bury the case -- which often happens when a criminal has political influence with local Communist Party officials -- the government, here, chose s to make an example of it. The guilty police chief was executed. "The only way to send a clear message is to give the harshest punishment possible," says Cha Ke, deputy governor of Xishuangbana district in southern China. "The situation has improved considerably since then," Cha reassures. In 1995, 17 people were arrested for poaching, and five were executed. Compared to these figures, in 1997, only one poacher was executed, Cha says. Efforts by Cha and many other officials like him to control poaching seem to stem from a growing realisation of the importance of protecting endangered or near-extinct animal and plant life. Officials are now aware of how wild elephants help attract tourists, who are fast becoming a formidable source of revenue in the area. In 1997, nearly two million Chinese tourists visited the region, where the elephant has been made an official symbol, up from 400,000 in 1990.